At the beginning of the year, Motan Colortronic updated several of their materials handling devices and modules, equipping them with new, clever functions. Motan Colortronic’s units for conveying, drying, dosing and mixing, as well as comprehensive planning know-how, lead to efficient, process-reliable solutions. With the coupling system METROCONNECT U / C, Motan Colortronic provides a high-quality manual coupling station for vacuum conveying systems. Easy to use, safe and reliable in the process, it forms a cost-effective entry into the central material supply. The customer can choose from an uncoded version and a coded version with RFID technology. Coupling station pipework is usually made from robust and easy to clean stainless steel. As an alternative, Motan Colortronic now also offer specially hardened, surface-nitrated distribution branches specifically designed for conveying particularly abrasive materials such as mineral or glass fibre reinforced granules. These are also suitable for problematic recycling materials. Already successfully used with the MINIBLEND V, Motan Colortronic has now adapted the mixer module 2l for the volumetric MINICOLOR V and gravimetric MINICOLOR G dosing units, as well as a version for integration with third party dosing systems. Various connection, assembly and protection options enable flexible use. The unit can be installed directly under the dosing unit on the machine or it is also possible to combine it with material loaders and proportioning valves as well as small drying bins. Motan Colortronic’s LINKnet 3.0 offers everything the customer expects from a state-of-the-art material management system: system utilisation, user administration and recipe management. Functions, such as provision of process data and archiving for subsequent systems, generate additional benefits for our customers. The modular structure of LINKnet 3.0 allows the extension of the standard for the implementation of specific customer requirements at any time. In order to centrally display alarms in the system, Motan also offers a simple, cost-effective version with the new ALARMcollector. 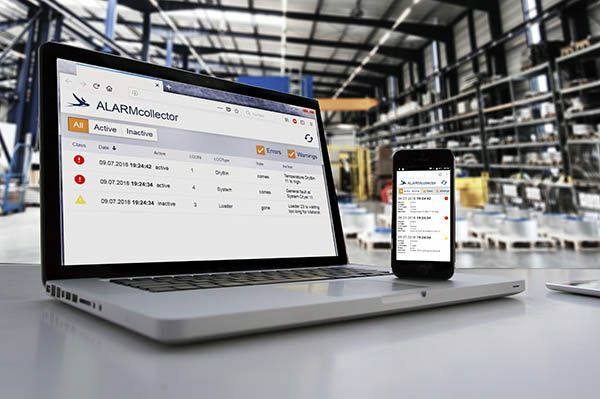 The practical alarm box opens up new possibilities for many customers to digitally monitor their production. In addition to the ease of use and setup of the digital display of alarms, the new ALARMcollector boasts a sleek design and user-friendly interface. The output of the alarms is possible on any Internet-enabled device.